We say a picture is worth a thousand words. President Putin holding a gold bar in front of the media is no accident nor a coincidence. By this image, he intends to show the world the importance Russia grants gold. Russia was, in 2013, for the second successive year, the largest announced gold buyer. This was partially achieved by regular acquisitions of its local mine supply. Russia and Kazakhstan bought more than half of the gross increase in gold reserves in 2013, according to CPM Group. At the 2009 G8 gathering in Aquila, Italy, then-Russian President and now Vice President Dimitry Medvedev showed reporters an example of a gold coin of a supranational currency, which he called a "united future world currency". The Royal Mint of Belgium created the coin and a special gold edition was presented as a gift to the G8 world leaders. Only President Medvedev was more than happy to appear in front of the media holding one. The significance of Russia’s increase in gold reserves at this time appears to be the ongoing caution Russia is showing over the US dollar and US dollar assets it is holding. Russia has moved its Treasury holdings to Belgium hoping that they are now out of the US reach. Russia is taking a prudent line of reducing its exposure to attack by further sanctions from the US. Included in this policy is the acquisition of more gold in its reserves at the expense of the US dollar. Russia sold 20% of its holdings of US Treasuries in March 2014 when speculation was at its highest that its assets would be frozen as part of sanctions over the Ukraine crisis. Russia’s holdings of US Treasuries (graph #1) as of March 2014 declined for five straight months while, at the same time, its gold holdings have increased substantially. At the consumer level, Russia is far away from China or India. Consumer demand in Russia is only 2%, which is half of the US demand of 4% and 15 times less than China’s (graph #2). With a gold consumption per capita of 0.67 grams Russia is still not far from that of China’s 0.94 and India’s 0.8 (graph #3). 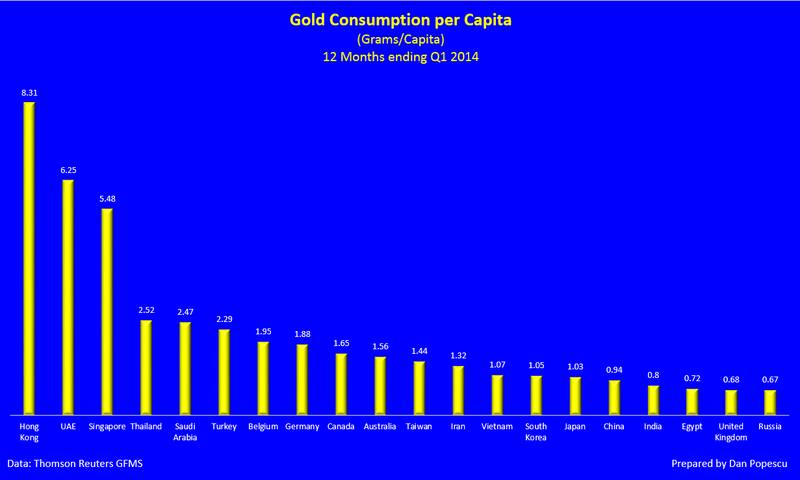 Observe also the absence of the U.S. from the list of the 20 largest consumers per capita of gold. If President Putin has encouraged the central bank to buy gold and is supporting gold for the international monetary system, he has not publicly encouraged Russians to buy gold nor facilitated gold purchasing. In this respect, Russia differs from India, which recently unsuccessfully discouraged private gold buying, and China, which actively encouraged and facilitated gold buying by its citizens. According to IMF data, on volume bases, Russia has about the same amount of gold reserves as China. However, China has not informed the IMF of its reserves since 2009. Speculation has it that China has accumulated substantially more gold since then. It is part of their geopolitical strategy in the currency wars for both Russia and China to understate their reserves. Based on International Monetary Fund (IMF) data, Russia has increased almost three times its gold holdings since the 2008 crisis. Also based on the IMF data, Russia is far ahead of China’s 1.1 gold percentage of total foreign exchange reserves, with 7.9%. However, as I mentioned above, China has not made public its holdings since 2009. If we look now on a percentage of GDP basis (graph #7), Russia, with 2.03%, is almost equal to USA’s 2.1%, far more than China’s 2009 number of 0.48%. If we assume that China has around 4,000 tonnes of gold rather than 1,054.1 tonnes, then with a ratio of gold reserves to GDP of 1.81%, both Russia and China would be much closer to that of the US. If we look now to the evolution of gold reserves of the BRICS countries and Saudi Arabia, we can observe that, with the exception of Brazil and South Africa, all the others substantially increased their gold reserves, as reported by the IMF (graph #8), right after the 2008 financial crisis. The Russian central bank has been buying gold from local production, but it does not buy its entire local production. According to the Russian Ministry of Natural Resources, the country has the 2nd largest gold reserves in the world at 12,500 tonnes. (11) However, according to CPM Group, they were the 3rd largest in 2012 (graph #9). Russia was also 3rd in 2013 in terms of gold mining production, after China and Australia (graph #10). As we can see in graph #11, Russia’s gold production continued to increase substantially in the recent years. In 2013, it increased by 8.3% compared with 2012. We hear very little about gold accumulation by private Russians, but let’s not ignore them. Russians know the value of gold and they do accumulate, but not in the same public way as the Chinese or the Indians. The recent events in Cyprus and the potential loss of a significant magnitude they faced did not amuse the rich Russians. They have begun to switch from paper assets to gold, but very discreetly. You will not see Russian mothers lining up to buy gold on television. Again, I would like to quote Russian bullion expert Dmitriy Balkovskiy: “Repressive Soviet laws are still on the books in modern-day Russia. It is illegal to buy or sell bullion bars anywhere except at banks that have a precious metals license, and very few have them. So if you buy or sell a gold bar from your friend or relative, you commit a criminal offense. There are also special rules for transportation of bullion bars, and breaking them entails a prison term. Taking bullion bars out of the country is illegal. Selling and buying of foreign-made bullion bars is also illegal. To top it off, there are enormous hurdles for bullion coin importers. The gold ruble was introduced in Russia by decree of Russian Emperor Nicholas II in 1897. Even the Soviet Union minted gold coins. Russians understand the value of hard assets and, in particular, gold. The not-too-distant memory of hyperinflation and currency devaluation of the ‘90s is still fresh in their minds. As we can observe in chart #12, since the collapse of the Soviet Union, gold has performed extremely well in russian rubles. Vladimir Ilyich Lenin banned ownership of gold by ordinary citizens soon after the 1917 revolution. In his memoirs, Nikita Khruschev quotes Lenin by saying “… that we should hold onto our gold for the time being? At a certain stage of development of human society [Lenin said] gold will lose its value, and therefore gold should be kept in reserve, to make public toilets out of. That’s what we’re keeping our gold for, and when the time comes and communist society has been established, gold will lose its value as a means of exchange, and then, to carry out Lenin’s testament, we will use gold to decorate the public toilets under communist society.” (13) Was he sarcastic or did he understand gold better than we think? Well, almost 100 years later, the Russian people know what happened: The communist system collapsed, but not the price of gold. Russian bullion expert Dmitriy Balkovskiy (14) says, “The old Soviet Union viewed gold and silver as strategic metals and a matter of national security,” and President Putin does it too. In 2007, then-U.S. President George W. Bush planned to expand the U.S. ballistic missile defense shield to Europe. It signaled to Russia that the U.S. had not abandoned its cold war mentality, that it still treated Russia as an adversary, and that nothing had changed. In response, then-Russian Prime Minister and now President Vladimir Putin claimed that such a deployment could lead to a new arms race and could enhance the likelihood of mutual destruction. In 2009, U.S. President Barack Obama announced that the planned deployment of long-range missile defense interceptors and equipment in Poland and the Czech Republic was not to go forward. However, the damage was already done. In a recent interview, President Putin, when told that, "NATO claims that the missile shield was not built against you [Russia] but against Iran", couldn’t help but laugh right into the journalist’s face. (12) President Putin became from that point on less interested in the G8 meetings and less collaborative with the G7 countries, and more focused on Asia. The annexation of Crimea in 2014 was just a confirmation of a return by Russia to a new version of the old cold war of the ‘60s. Gold is evidently part of this new russian financial cold war strategy. Both Russia and China have decided to put gold at the center of their currency war against the “exorbitant privilege” of the US dollar. During a press conference at the 2014 St. Petersburg Forum, President Putin hinted that some discussions between China and Russia are taking place concerning gold and foreign exchange reserves. Both countries have made frequent comments that they are not happy with the current international monetary system, based on the US dollar, that gives the US an “exorbitant privilege” and that they are working to change it. China seems to be more patient than Russia. The recent events in Crimea will accelerate, in my opinion, the actions both Russia and China will take. Recently we have seen an acceleration by both countries to bypass the US dollar in international trade and, at the same time, an increase in their official gold purchases.